At no time during post production is there not a need for substantial tweaking to our ambient audio, narrations, musical soundtrack and the need for some well placed foley effects to supplement our productions. The BCC has collated years and years of all the audio they have captured related to the sounds of nature into one large collection consisting of 70 categories and 18,368 different audio wav files. 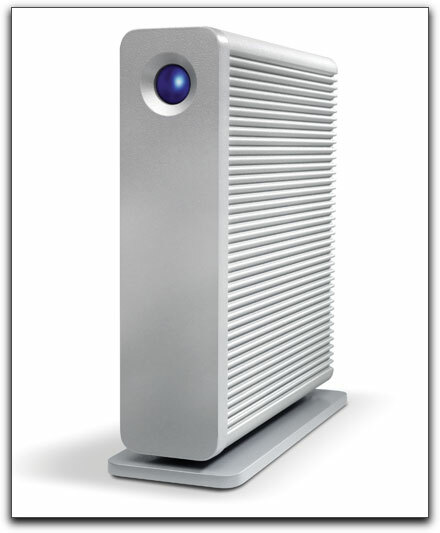 The entire collection was delivered on a 500gig Lacie d2 Quadra external drive with eSata, firewire 800, 400 and USB 2.0 ports for full compatibility and connectivity to either Mac or PC users. Pro Sounds Effects, the company that now markets the BBC collections, has now partnered up with Lacie for delivery of their large and small sound effects libraries with the smaller delivered on Lacie's Rikiki compact hard drives. The drive is so quiet, you forget it is there. Each file has been recorded for this collection as a 16 bit (Little Endian), 44.1kHz stereo audio clip with recordings that date back as far as 1963 up to the present and represent the sounds of nature literally from all over the world, from Borneo to Alaska to Nigeria to some places I never heard of, and supply any editor with almost every possible audio file they could ever ask for or need. The library is delivered at 16/44.1 kHz, the way they were originally recorded. Rather than to up-sample the libraries for marketing purposes, and thus give the false impression that they were recorded at 16/48k, Pro Sounds Effects took the high and honest road. However, Pro Sound Effects can certainly offer any format to their customers, from 16/48 to 24/48. It might have been a good idea to offer the option of the up-sampled library to Final Cut Pro users but converting any of these audio files is not a difficult or terribly time consuming task. As a Mac user, I would also have preferred Quicktime rather than Wav. files but changing the default to open them in QT 7 was also quickly and easily done. Another reason for the 16/44.1kHz files is that these are sounds that have been compiled over the years when the main distribution format was still CD. The Nature library includes never before released sounds and, while some have a vintage sound and may be in mono, the quality of the bulk of the recordings are crisp, clean CD quality and are perfectly useable for productions requiring high fidelity sound. Fortunately, I have been to many of the recording locations around the world and when comparing what I remember hearing, my own recordings and the BBC Nature Collection, I could denote no false sounding audio. 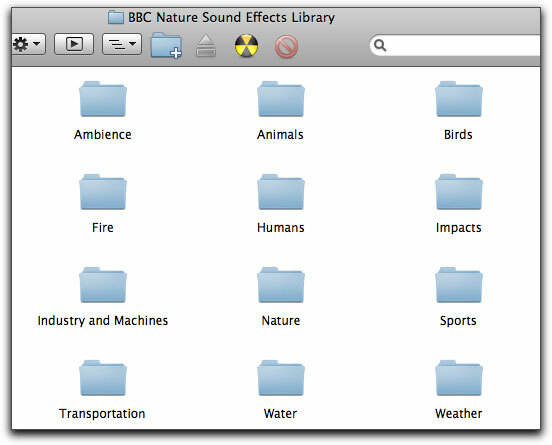 Initially, when opening the BBC Nature Sound Effects Library you are presented with 12 folders covering water sounds to fire to ambience and more. It is when you open any of these folders that you are presented with a plethora of choices relating to so many of the numerous recording locations. For example, when opening the Ambiance Folder you then have a massive number of audio recordings from almost any type of setting you can think of. Open any of those folders and you will plenty of different audio recordings of varying lengths and audio 'feels'. These are the audio options from just the Ambience folder. Pick your recording setting, be it from your local park to the veldt lands of Africa. 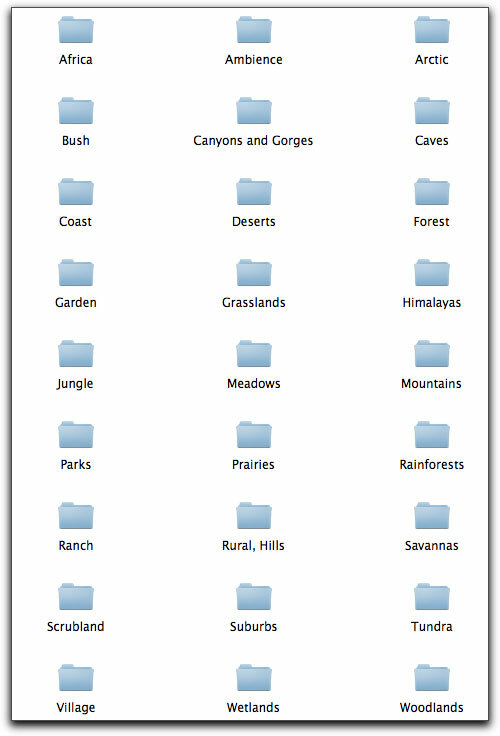 Find your way to the Animals folder and you will find several sub folders containing the audio of deer, bears, lions, a variety of apes, monkeys and other primates, moose, rhinoceros and too many more to list. In the Industrial Sounds library there are the sounds of an ice drill, handsaws and even a butter manufacturing machine. Not sure that qualifies as 'Nature' but there you have it. In the past, I have found many audio effects libraries to contain audio files very short in length preventing a build up of ambient audio prior to, for example, a lion's roar or the build up of sound prior to the crackling of thunder. Not so in this the BBC Nature Library. Most clips run from anywhere from 30 seconds to 3 minutes or more providing realistic ambient build up for any film or video project. So, with over 18,000 audio files, how do you find your way through the maze of clips? Pro Sound supplies a track-list which can be opened in Excel or as a PDF. The PDF opens as a 168 page document that you will definitely need to zoom in on. There you will find full descriptions of each audio clip and their names, who recorded them and where as well as a host of other info. Why the fonts and sizes are different is probably because that is the way they were listed historically. I'm only guessing. Never the less, it would have been easy enough for Pro Sound to create this list using the same font and size. Just an infinitesimal sampling of the tracking PDF that is supplied. Opening the Excel version brought up Apple's iWork application 'Numbers' which provided a great deal more consistency when viewing. A bit more like it for my tastes. But wait, that's not all! Making it even easier to locate specific audio tracks, the BBC Nature Collection on the Lacie Quadra comes NetMix Lite sound effects search software for you to install. The software installers are included but do not attempt to do the install from the external Lacie. Drag the installer over to your desktop first and then install. Once installed you can drag and drop any of the folders you want containing your sound effects contents and a database will automatically be created. I did not test this specific software for this review but there is a good video tutorial on Vimeo on how to most efficaciously use it. There are both smaller and larger BBC audio collections and they are priced accordingly. To sum this up, it is hard not to be aware that these excellent audio libraries do not come inexpensively. For the professional editor or production house, the cost and tax write offs may prove to be palatable but even then, they are definitely a chunk of change. My bottom line is that I have no argument with their quality, their price, maybe. Of course the 3 year data replacement policy/warranty doesn't hurt. I'd say that the aural quality of the BBC Nature Library is superb even with many of the older audio recordings. The diversity of the library has not been matched by any other collection that I have come across. The biggest draw for these BBC libraries is that they're truly global, and contain extremely rare sounds that you simply cannot really find elsewhere.